Now that summer is about to be in full swing, there is no better time to check in on your senior loved ones and to make sure that they are drinking plenty of water. 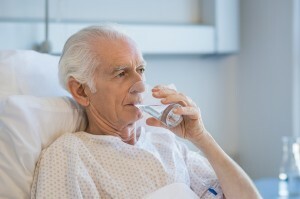 A majority of seniors today actually don’t drink as much water as they should and are at serious risk of dehydration. This becomes an even bigger problem in the summer when heat indexes get high and dehydration becomes even more likely. Dehydration is a very serious issue for all people, but it can be even more treacherous for elderly adults. In fact, it is one of the most common reasons for hospitalization in seniors today and can even cause death among senior adults. Dehydration is also linked to issues with weak pulse, low blood pressure, kidney stones, blood clots and more. With this in mind, if you are looking after a senior loved one, there are several things that you should do in order to make sure they are staying properly hydrated. This, of course, means drinking plenty of water. If your loved one isn’t drinking enough water regularly, here are six tips for getting them to drink more water so they can stay healthy and hydrated all summer long. In general, the more liquids that seniors can drink, the better. So, while you can easily substitute fresh fruit and vegetable drinks for water from time to time, you want to avoid drinks that are overly processed or high in sugar. It is also very important to avoid alcohol and caffeine as these can actually dehydrate the body and have the opposite effect that you are looking for. Whenever your loved one reaches for one of these drinks, substitute it with water. Sometimes seniors get bored with just drinking water, and that is alright. Instead of forcing them to keep drinking plain water, consider adding all-natural flavor to change the taste. You can add lemons, limes or cucumbers to your water, or you can find a natural flavoring agent. Just make sure that you read the label and make certain the flavoring is natural and not filled with too much sugar. For some seniors, not drinking enough water all comes down to the fact that they simply can’t access it. Keep water in a place where seniors can easily serve themselves, and don’t have to go looking for or reaching for the water they need, it can really go a long way. Most people who try to get seniors to drink more water, will ultimately try to sweeten water or attempt to offer fruit juices. If this isn’t working as much as you would like, try the savory approach instead. Hot soup broth is a great, filling way to introduce more water into the diet and it can be a great, hydrating addition to your loved one’s lunch. If your loved one needs to cool down this summer and is feeling overheated, consider making your own homemade popsicles. You can use fresh fruit, squeezed fruit juice and water to make this fun summer treat. Making your own popsicles instead of buying highly processed ones can also help ensure you are giving your loved one a healthy option that can truly help hydrate them.